Is outsourcing your graphics to a third party a hassle, especially when you have to go back and forth to make changes before the project is completed? This is exactly why we designed this bootcamp - to teach people just like you how to easily get started with Photoshop- it’s time to make your brand look beautiful. 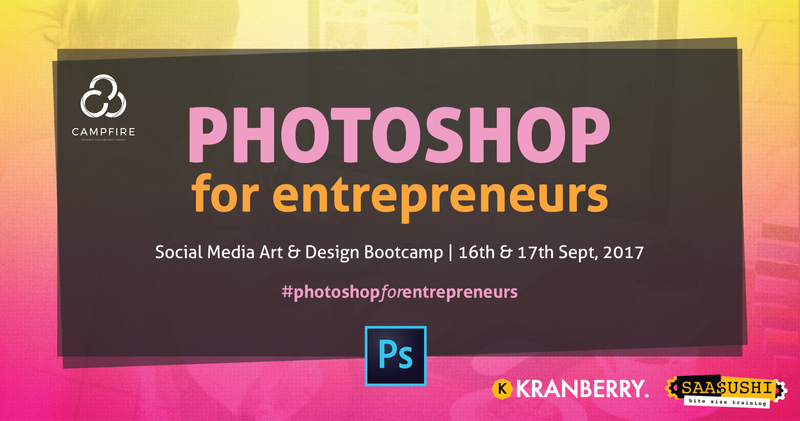 Photoshop for Entrepreneurs is a "Photoshop bootcamp minus the push-ups." Learn how to create vibrant, unique and eye-catching content for your social media and business so that your work doesn't just sound good, but looks good too! We teach the basics from scratch as well as some more advanced techniques. You will then apply the skills into your own layouts and creations which can be used for your business when you go back to work! This is a beginner to intermediate course which is designed to be helpful to business owners, entrepreneurs, those with communications, marketing, design, sales and business development responsibilities. Bring your laptop, and photos/images related to your business to make the most of this bootcamp! Karishma Sujan is the founder of Kranberry Studio and an Award-Winning Designer with years of professional experience in Digital Design, with depth experience in leading digital projects related to UX/UI, Web Design, Branding & Creative Direction. Some of the names she has worked with includes DBS Bank, Time Warner, Cathay Pacific, Ovolo Hotels, Gibson Innovations, etc.